Home All Articles Where would F1 race in Las Vegas, exactly? Mentioned in a passing comment over the future of the Italian Grand Prix for 2017, Bernie Ecclestone has revealed that organisers of a potential Formula One race in Las Vegas, Nevada have a race contract, meaning quite soon we’ll see F1 cars competing in another desert environment. While this initially feels like a great addition to a calendar already overflowing with diversity – including the dubious additions of Bahrain, Russia and Azerbaijan in recent seasons – the inclusion of Las Vegas would open up another new market, but the confusing question still remains – where would the track actually be? Think Las Vegas and you immediately think of the gaggle of casinos, restaurants and gaudy light bulbs that is The Strip, boasting 15 of the world’s largest hotel resorts. If there was anywhere that a track, or at least part of a track, based in Las Vegas needed to run through it would have to be here. Hermann Tilke has been reported to have visited the area several times to try and design a street circuit that would incorporate a section of this American landmark, it’s got that close to fruition. The problems arise with that are exactly the same as any other busy city that relies on tourism as its main source of income; being able to close down a large chunk of streets so people can go racing. Vegas wouldn’t be that affected due to the nature of its tourism, both domestic and international, being so diverse that holding a motorsport event wouldn’t cannabalise a single market; people will still gamble and party with cars flying past or without. An event like this hasn’t happened as of yet in the heart of Vegas, although in 2007 the IndyCar series managed to host a race further north of The Strip that allowed several casinos to be featured in the background, much like the proposed New Jersey GP wants/wanted to do with the Manhattan skyline. The main dispute, if part The Strip was to be used, is which casinos would benefit and which would not? It is 4.2 miles (6.8 km) long in total, which is far too long for just a single straight of track – in comparison, the longest on the current calendar in China is one seventh of the length – so having F1 cars whizz by all the resorts in one go is a pipe dream. The infighting between the likes of the Bellagio, MGM Grand and the Luzor as who would have the rights to be part of the circuit would grind any deal done to a sudden halt. And, just to throw a final spanner in the works, you’ll have a percentage of the 62,000 hotels rooms on that stretch of road being able to see some, if not all, of the on-track action for free. Organisers could always lease the race to the highest bidder and have them stage it on their land, exactly like Caesar’s Palace in 1981-82. Again, there are issues here; the car park those races were held in is now fully built on with roads and shops, and with space now more premium than ever in Vegas, parking structures go up rather than out, limiting what can be used. Luckily Las Vegas has a purpose built racetrack for any such event, but the Las Vegas Motor Speedway is an oval track which only regular business is NASCAR and drag racing – two sports which are very much American and very much the other end of the spectrum from the Euro-centric F1. The circuit also hasn’t held an open-wheeled race since the tragic IndyCar accident that cost British driver Dan Wheldon his life in 2011, being removed from their calendar soon after, and would need heavy investment to create a road circuit hybrid with the banking and getting facilities up to the requirement standard. 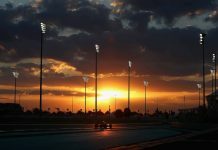 This would also create the same kind of tyre contruction issue that blighted Michelin at Indianapolis in 2005, a race that was synonymous with F1’s exit from America in the mid-to-late 2000s. 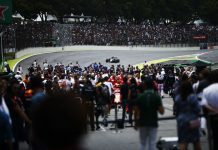 One final option would be to look for land in the area and build the facilities from the ground up, a la Circuit of The Americas, giving the area a boost in jobs and offer another high quality motorsport venue for the country. In fact the BBC has reported that the small town of Cal-Nev-Ari is for sale at a cool $8m, including a hotel, casino and airstrip, and has already had interest from investors looking to develop a motorsport park. And being 70 miles south of Las Vegas, it’s far enough to establish itself away from the glitz if the casino strip, yet close enough to trade off the name. But there’s also been the same for a renewable energy project, retirement community, survival school and, if the drug ever became legal in Nevada, a “marijuana resort”, whatever that means. There are options for Formula One to make a triumphant return to the city of sin, but for every positive reason for each there’s just as many in the opposite direction. Whether Vegas shoehorns onto the calendar is up to the organisers and Bernie striking that perfect deal, but the plans have to be as watertight as they can get, not, if you will excuse the pun, a throw of the dice.